The third member of the Rice Harmony group that I hung out with was Eshya. She’s an environmental scientist by trade, but her job here goes far beyond the usual science and engineering aspects of environmental management. She’s conducting research on the government’s agricultural policies, while spending time with farmers in the village to understand better how their current farming methods mesh with their way of life. Eshya decided to capitalise on my visit, and dragged me along to a set of meetings with bureaucrats in the local government agriculture offices. 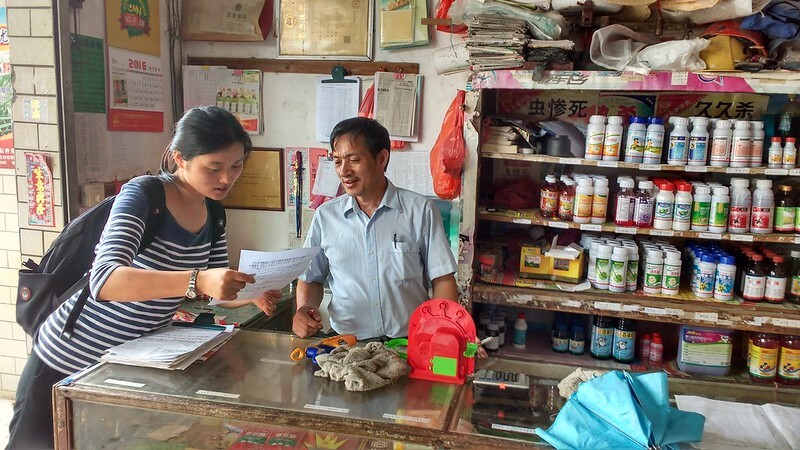 She wanted to find out what the government pest control recommendations are for rice farmers. Sometimes it’s difficult for ordinary people to get access to government workers, and Eshya’s hunch was that the spectacle of having a foreigner along for the meetings might be helpful. And it was! Well, I didn’t actually do anything, but I believe I was a useful prop. All I did was sit there drinking endless cups of tea and smiling serenely, and handing out my university business card to all and sundry, while Eshya had four meetings with Serious and Important Looking Men in charge of agricultural administration. 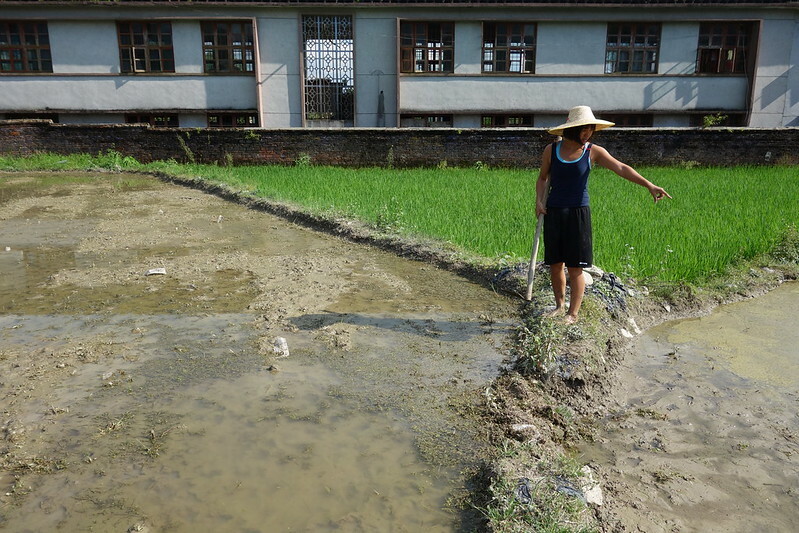 Her method is a bit like a “mystery shopper” – she presents as a customer, and describes the particular problem she’s having with her rice crop (some sort of bug infestation). She then asks what the government recommends as a response to this problem. In the above photo, you can see Eshya looking at a piece of paper the shopkeeper has handed her. That paper has the government recommendations in simple terms. Basically, farmers are advised to use this or that pesticide depending on the insect that is bothering them. There aren’t any recommendations about alternative, non-chemical methods of controlling pests. One of the most important things that Eshya does isto spend time with the farmers in the local village. Each night after dinner she checks her list and pays house calls to two or three families. 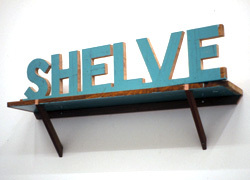 This is a relaxed time of day when the urgency to solve immediate problems is less intense. One of her aims in these informal conversations is to try and understand, from the farmers’ perspectives, what constrains them from transitioning to less chemical-intensive methods. In many cases it’s labour. From what I could gather, it’s only been since the 1980s that the government has been recommending pesticide and fertilizer use for rice farming. These farmers still remember a time before that, when the work that the chemicals now do was performed by human yakka. For example, hauling bulky manure and compost requires more heavy lifting than spraying a concentrated soluble fertiliser. So the advent of chemical farming was something of a relief in what is a very labour-intensive occupation. On top of this, the current farming generation is ageing. The children of farming families from the village now have the opportunity to travel to the big city to study. There are so many diverse (and better paid) career paths available to them, and so they don’t tend to return to the farm. When their parents retire, they sometimes follow the kids to the city – and so the village starts to empty out. This is one of the complex problems facing farming in China today. Nobody that I spoke to seemed to have an easy solution. Farming is simply too laborious, and too low-paid, to be attractive to the younger generation. Who will grow the rice in the future? Will China become a net-importer of rice from other, poorer countries? In this photo: Aunt Tang, Tang Zeke, Tang Zeping (Tang Zeke and Tang Zeping are brothers). Standing at the back is ShuHao Lin. On the right is your humble author, Lucas Ihlein. I’m familiar with some of these social problems associated with farming. In Australia, the economics of farming have tended towards fewer farms, much larger farms, and more mechanisation. This can results in social and geographical isolation, and the depopulation of rural centres. Eshya and I talked about all these problems, and I showed her the work I’d done previously with Ian Milliss on The Yeomans Project, as well as its successor Sugar vs the Reef. We were excited about the crossovers in the work of Rice Harmony and in my creative arts approach. I do hope that we have a chance to share strategies again – perhaps via the Kandos School of Cultural Adaptation, which is also grappling with very similar issues around regional culture, environmental management, and agriculture. 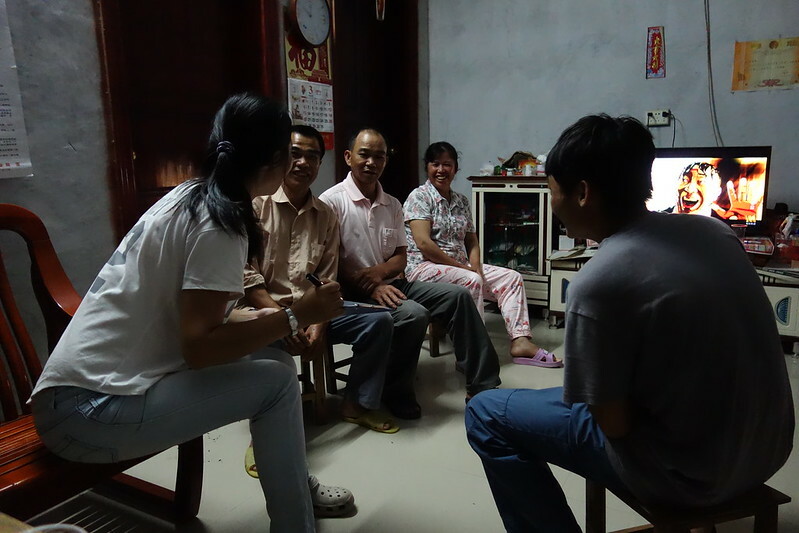 “Eshya and the Farmers” is one of three blog posts about my visit to Xiangyang Village in Guangdong. 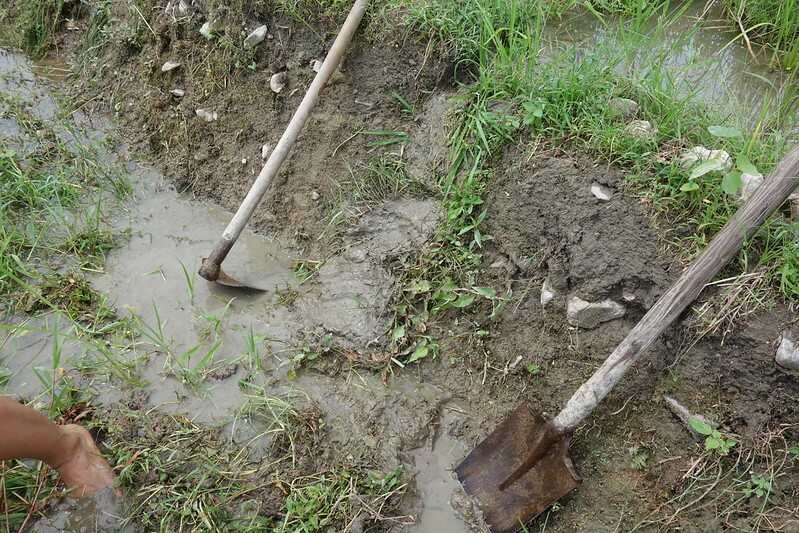 In the first post, I spend time with Linda in the mud of the rice fields. 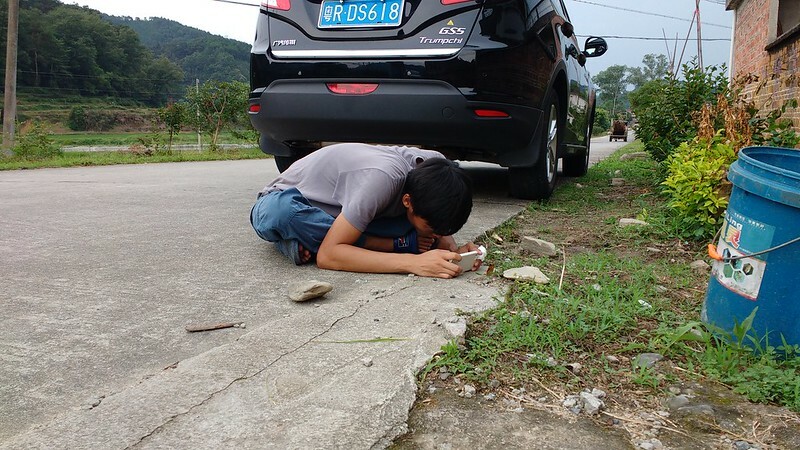 In the second post, I hang out with ShuHao and go looking for bugs and frogs. This adventure in the rice paddies was brought to you by Guangzhou Delta Haiku. 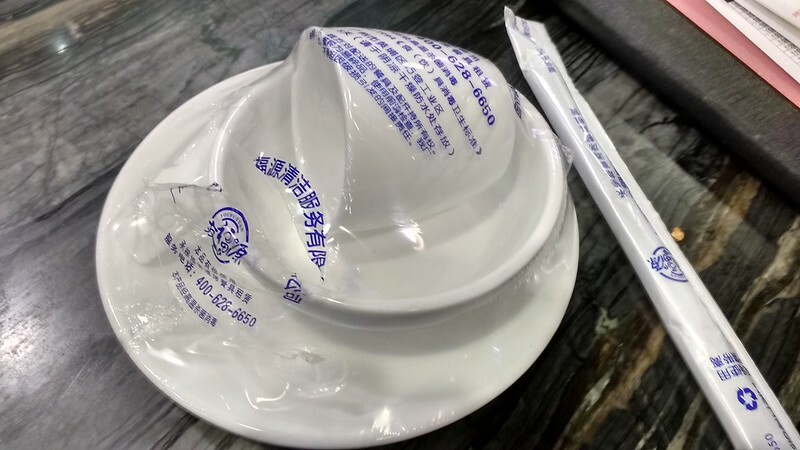 This entry was posted in agriculture, residencies and tagged china, guangzhou, haiku on June 20, 2016 by Lucas. While I was in the village, Linda’s colleague Shu Hao took me out on a nightwalk. This is his specialty. He’s the Rice Harmony expert on biodiversity, so his job is to keep an eye on all the other (non-human) lives that proliferate alongside the rice. 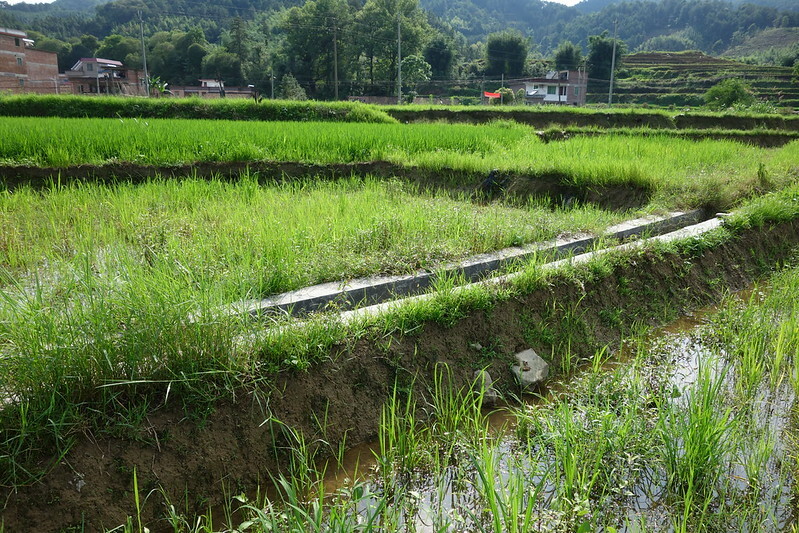 Tracking biodiversity is a method for gauging the health of the local environment in which the rice is being grown. To put it bluntly: the more toxic chemicals there are, the fewer species will be present. Night time is when many of these small creatures come out, and so Shu Hao loves to go on a walk with a torch to see what he can discover. 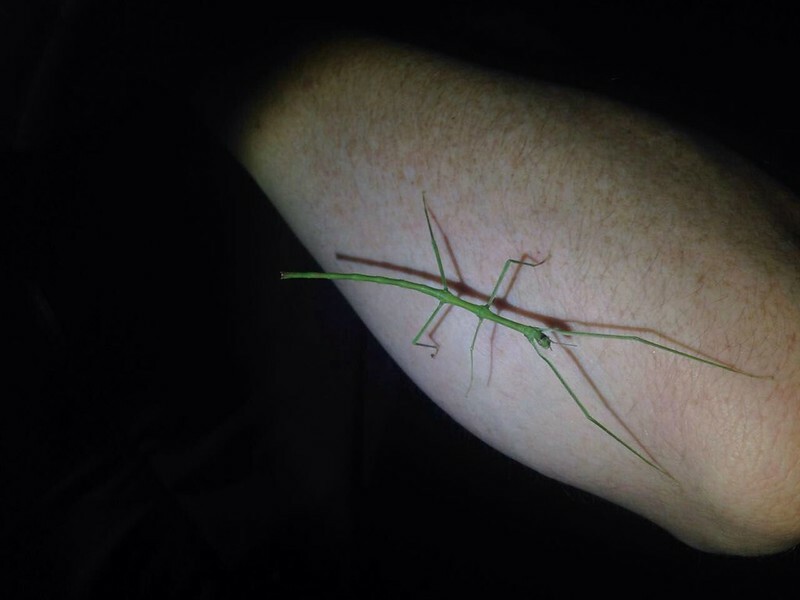 Frogs, toads, tadpoles, crickets, grasshoppers, stick insects, moths, fireflies (fireflies!! ), caterpillars, ants, spiders, snails, slugs, beetles, bugs: we saw multiple varieties of all of these, and Shu Hao responded with fascination and respect every time. He paid close attention in order to observe the patterns of behaviour of each of these animals. I recently attended a talk by Hildegard Westerkamp, one of the pioneers of “acoustic ecology”. She spoke of the use of audio recording as a method for documenting the biodiversity of a geographical location. The idea is that you return to the same spot at the same time of year, over several years (or decades) and then by comparing the audio mix, you can get a sense of what is changing in the ecosystem. At this point, the diversity of life forms in the Rice Harmony village seems very strong. In fact, Linda explained to me that one reason why they selected this place to set up their social enterprise – that it was still part of a relatively healthy environment. 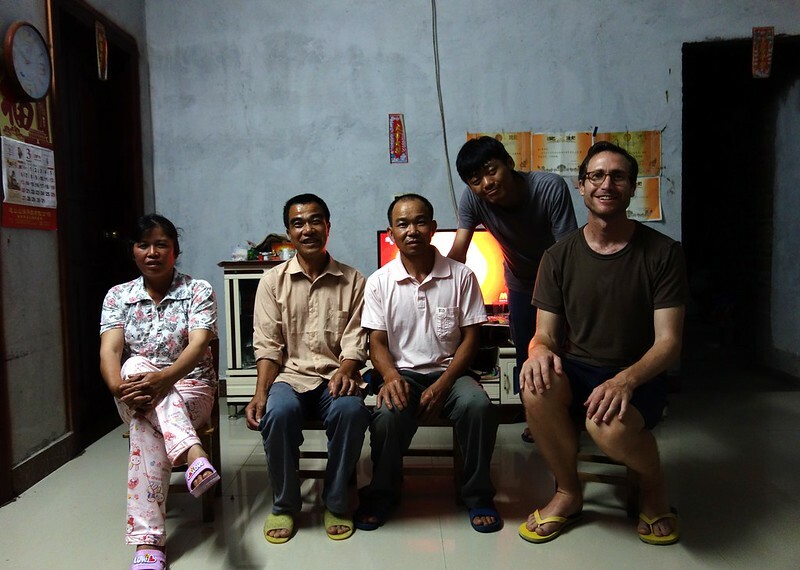 “ShuHao and the Insects” is one of three blog posts about my visit to Xiangyang Village in Guangdong. In the first post, I spend time with Linda in the mud of the rice fields, and in the third and final post, I accompany Eshya to visit some agricultural bureaucrats, and sip tea with some rice farmers. One of the highlights of my time in Guangzhou was an opportunity to leave the big city and visit a farm. Strangely, for an area like the Pearl River Delta that was built on agriculture, it wasn’t easy for me to find a farm. I don’t speak or read Mandarin, and the Great Firewall doesn’t make internet research very easy. 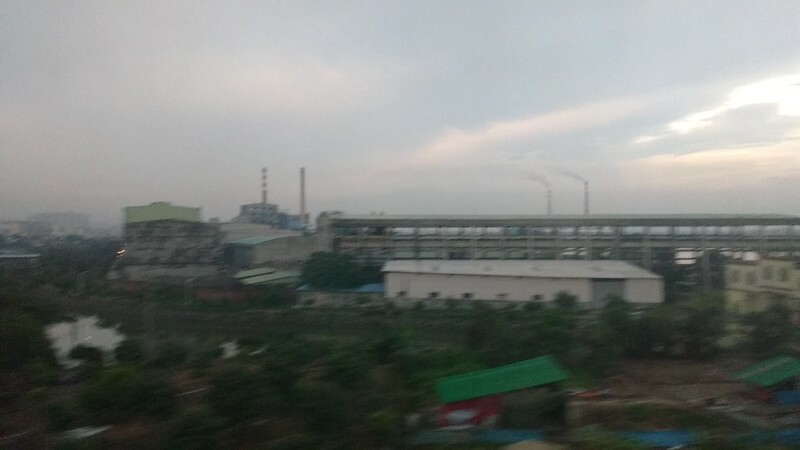 Plus it seems that over the last 30 years, massive industrial and housing development has really pushed agriculture out of Guangzhou. 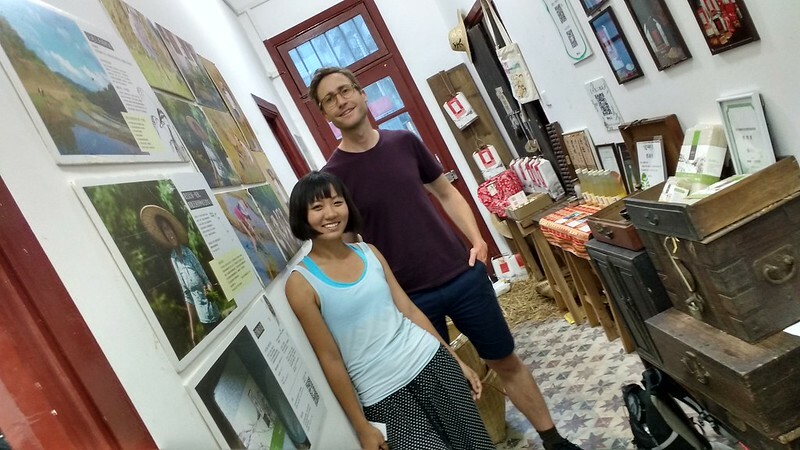 Because of all the other work I’ve been doing on agriculture, I really wanted to feel for myself how farming in southern China is different from Australia, so I kept prodding Hanting (a local Guangzhou artist and our hardworking “fixer”) to “find me a farm!”. 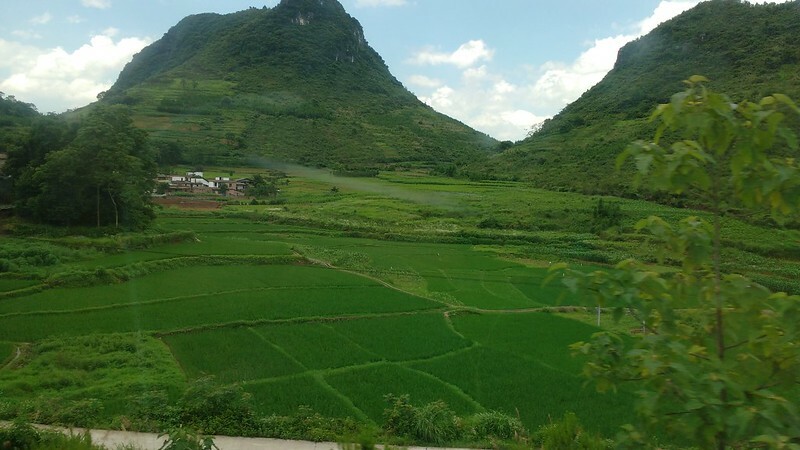 Eventually Hanting’s extensive network came through: her friend Huáng Hé dug up a link to Rice Harmony, and we called them up and arranged a visit. Linda invited me to come and visit the village where Rice Harmony is collaborating with a network of local farmers. 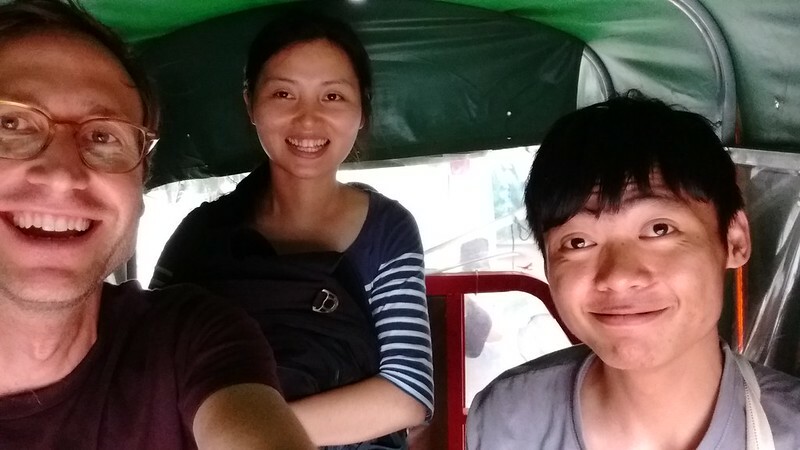 The day after our exhibition launch at Observation Society, I jumped on a provincial bus for a four-hour journey to the town of Qingyuan, where I experienced two extremely interesting days with some of the Rice Harmony people: Linda, Eshya, and Shu Hao. Notice all those yellow and red sacks? They are full of organic fertilizer. The Rice Harmony team is a social enterprise. Their method is really interesting. While I hung out with Linda in the fields, we talked through the challenge that the group has set itself: They are a business. There are about 15 employees. They sell rice on behalf of some of the farmers in the village. Their goal is to transform local farming practices to be less reliant on chemicals (fertilizers, pesticides, herbicides). This is one of the most interesting things that they do: although the Rice Harmony members have no prior experience in growing rice, they are now learning how to do it, with the local farmers as their teachers. They rent a series of un-used rice paddies for this purpose, and Linda has taken on the task with gusto. 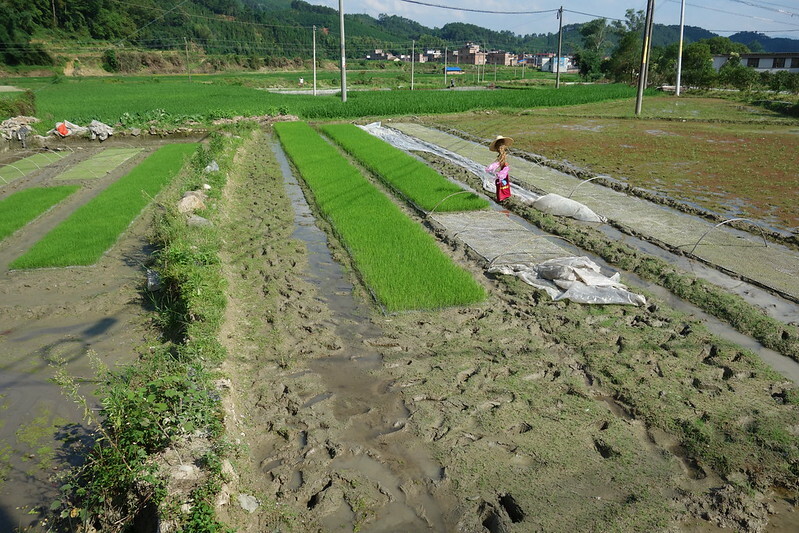 In the above photo, the two lovely looking green carpets are Linda’s early experiments in striking rice seedlings. These will soon be transferred and planted out in the field. (Meet “Mike” the scarecrow on the right hand side of the shot). This water is “free” – there are no debates around rationing or “water rights” here. If a farmer wants to flood her paddy, she’ll just stack some rocks and a clod of grass behind a strategically placed hole in the concrete culvert, and and water will flow in. Playing with water levels in terraced rice fields is quite fun. Linda and I did the rounds of the paddies she’s in charge of. She’s still getting her head around the topography. Depending on how much water you want, you simply build up, or chip away at, the mud walls of each paddy. The tools are ancient: a long handled hoe, and a shovel. When the water reaches the height of the wall, it flows on into the next paddy down, and so on, eventually making its way back into the river. they offer an alternative market to the conventional fertilizer-pesticide rice market, for those farmers who are interested to transition to a chemical-free method. 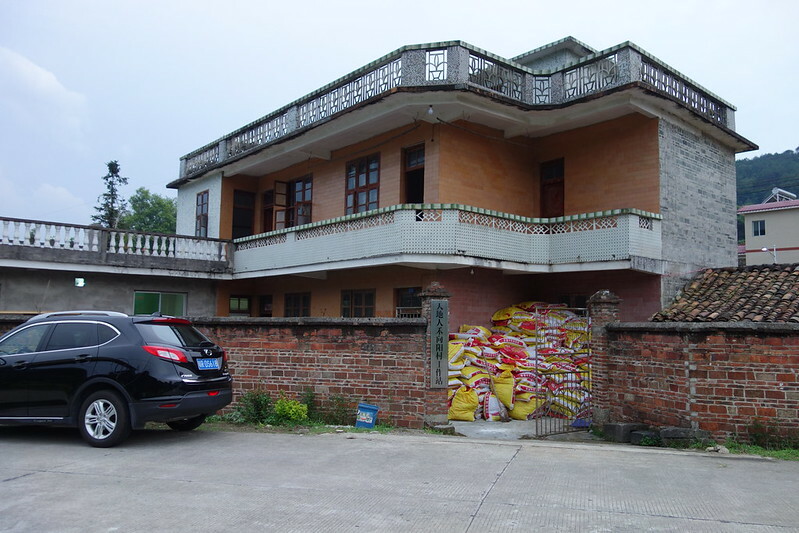 “Linda and the Mud” is one of three blog posts about my visit to Xiangyang Village in Guangdong. In the next post, I hang out with ShuHao and go looking for bugs and frogs, and in the third and final post, I accompany Eshya to visit some agricultural bureaucrats, and sip tea with some rice farmers. 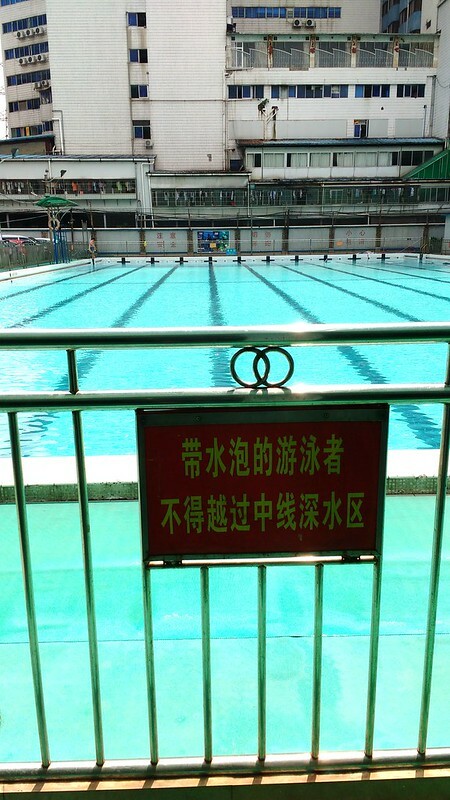 This entry was posted in agriculture, residencies and tagged guangzhou, haiku on June 20, 2016 by Lucas. 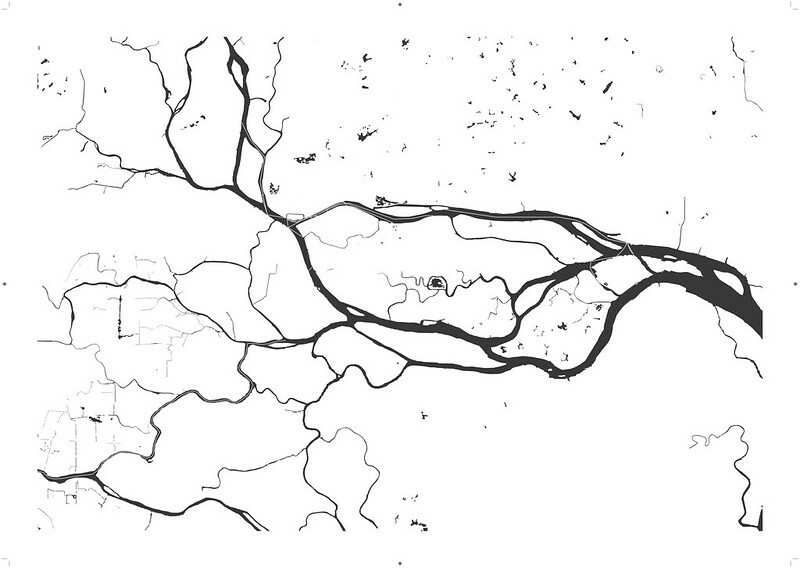 Pearl River Delta Flood Animation from Luca Zoid on Vimeo. 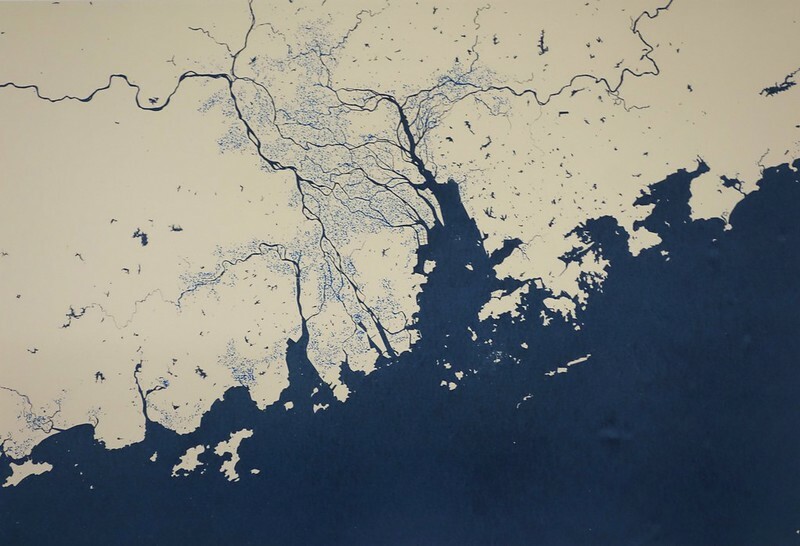 This short animation shows possible flooding caused by sea level rise in the Pearl River Delta region of China. Sea level rise here goes from 1 metre (likely by 2100) to 60m (projected maximum assuming the melting of all polar ice). Graphic Design and animation by John Causley from Big Fag Press. Produced as part of Lucas Ihlein’s Guangzhou Delta Haiku project, exhibited at Observation Society in Guangzhou, June-July 2016. This entry was posted in residencies, sustainability and tagged animation, china, guangzhou, haiku, video on June 14, 2016 by Lucas. 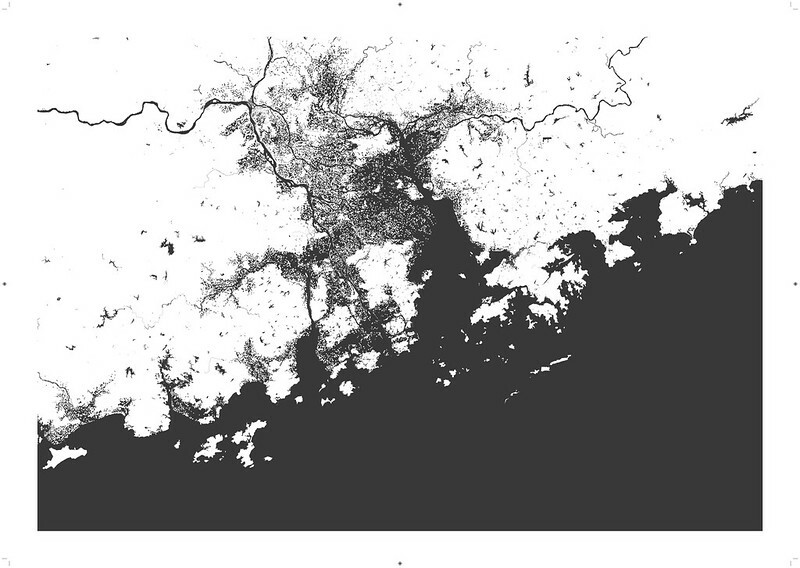 Pearl River Delta region. Light blue colour indicates current land below sea level. Sea level rise is influenced by a wide range of factors. The most obvious causes are associated with global warming: the thermal expansion of the oceans, and the melting of glaciers and Antarctic ice sheets. More complex local factors include tidal variations, warm and cool ocean currents, the building of sea-walls to hold back the water, and the damming of rivers further upstream. 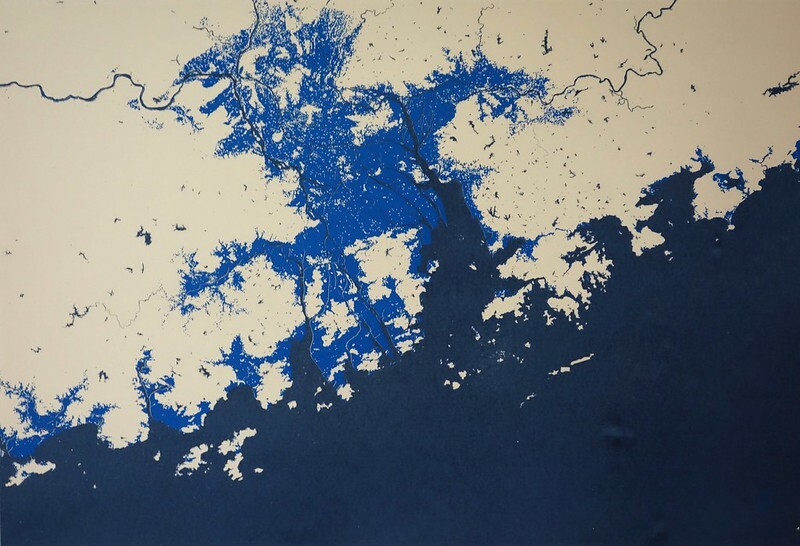 Pearl River Delta region – light blue colour indicates potential flooding caused by a one metre sea level rise. The screenprinted maps shown here cannot show the full complexity of this situation. 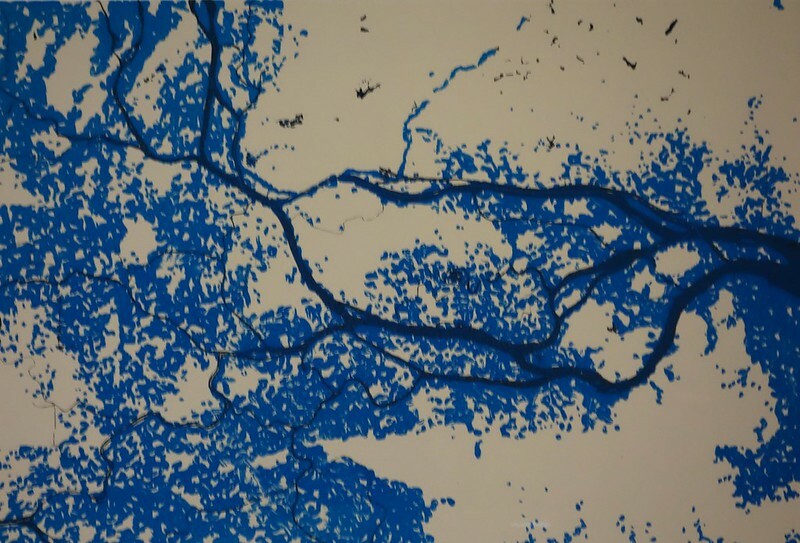 Rather, they employ “bathtub modelling” – a simple way of showing what might happen if seawaters were to creep up onto the land in a uniform way. Although it is nearly impossible to predict the local extent of sea level rise with any precision, the Intergovernmental Panel on Climate Change suggests that a global sea level rise of 98cm by the year 2100 is very likely. This corresponds roughly to the “one metre” maps presented in this exhibition. 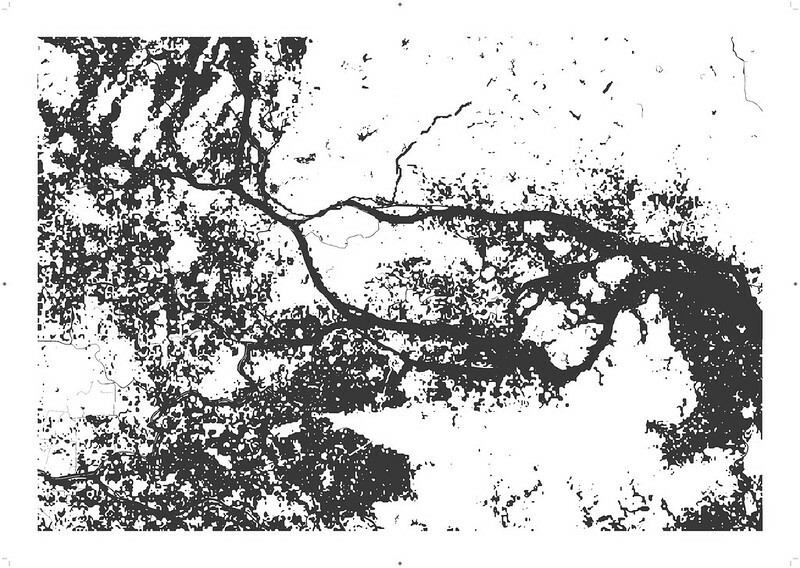 A “five metre” map is also shown – which is entirely possible if polar ice deposit melting continues to accelerate. 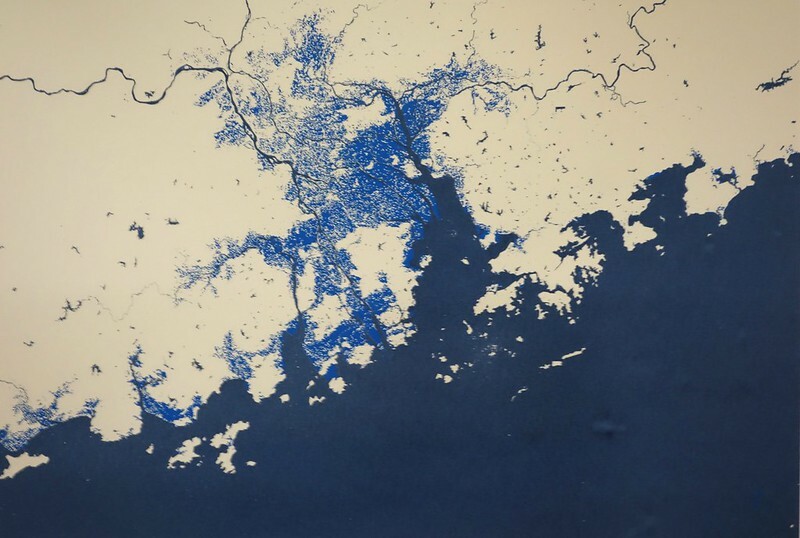 Pearl River Delta region – light blue colour indicates potential flooding caused by a five metre sea level rise. The animated map depicts a massive “60 metre” sea level rise, which is a possible scenario if all the world’s polar ice was to melt. How will the city evolve? What kinds of decisions will the city make to survive over the next hundred years? What does “survival” even mean? And what do the people who live here think about all this? 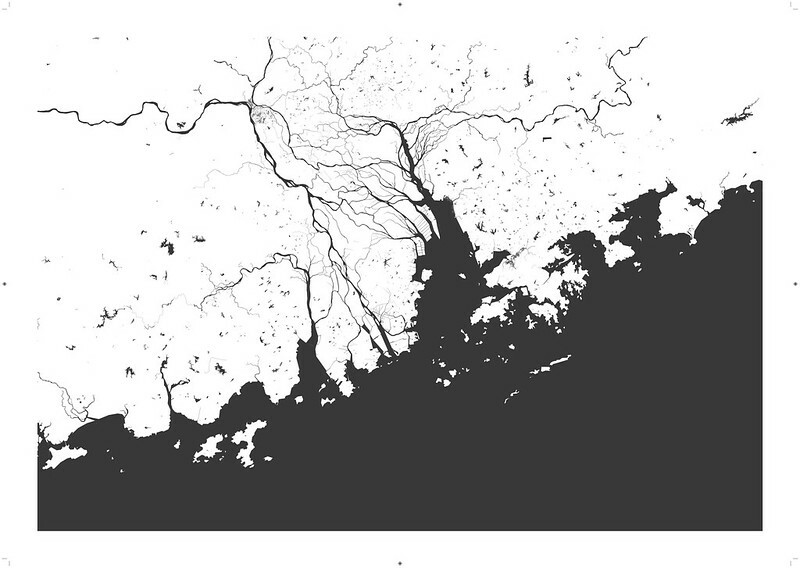 Haizhu area of Guangzhou – this map shows current river arrangements in this heavily populated zone. Haizhu area of Guangzhou – light blue colour on this map indicates possible effect of one metre sea level rise. This investigation is ongoing, and your correspondence is welcome. 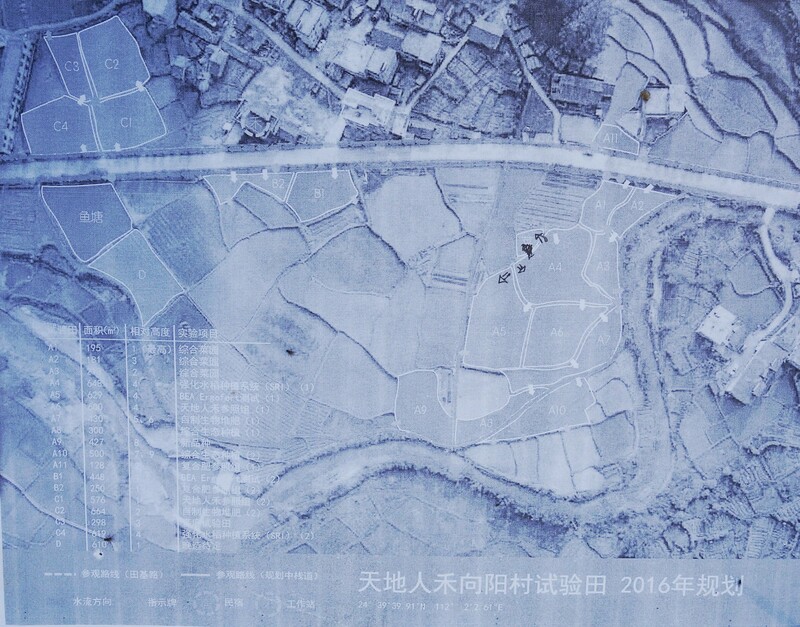 This entry was posted in agriculture, residencies, spatial politics and tagged china, exhibition, guangzhou, haiku on June 14, 2016 by Lucas. Please Hop Out By Half Ten Sharp. This entry was posted in residencies and tagged guangzhou, haiku on June 1, 2016 by Lucas. 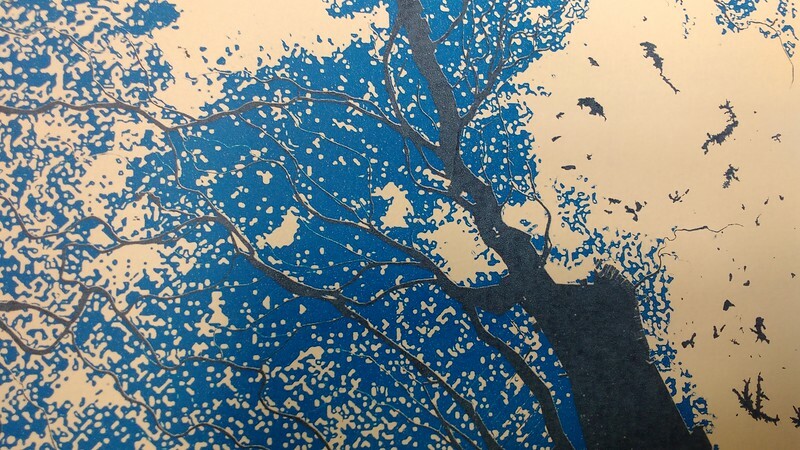 This entry was posted in residencies and tagged guangzhou, haiku, mapping, printing on May 28, 2016 by Lucas. 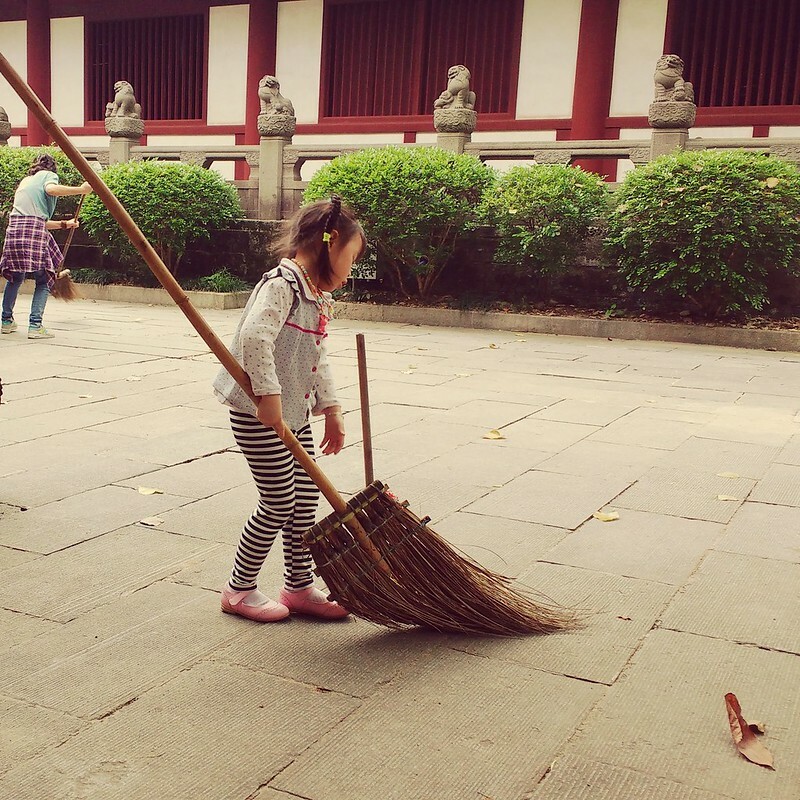 This entry was posted in residencies, tourism, writing by me and tagged guangzhou, haiku on May 27, 2016 by Lucas. I’ve returned to Guangzhou for the second time. This time working towards an exhibition called Sea Pearl White Cloud at Observation Society, alongside Trevor Yeung. Between trips to Guangzhou, I’ve been working with John Causley, a graphic designer from Big Fag Press. We’ve been using map-making as a way of trying to understand the problem (or is it?) 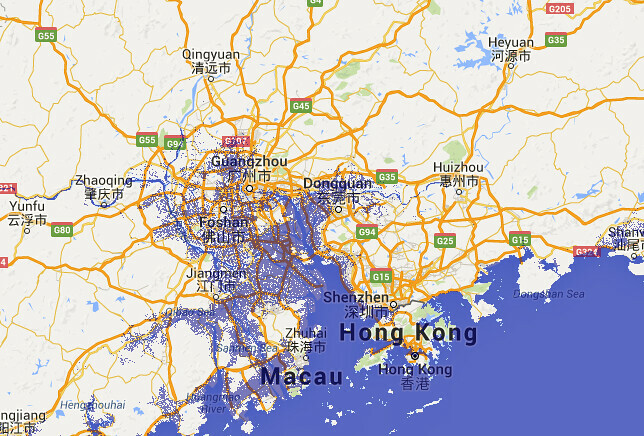 of sea level rise, and its future impact on the Pearl River Delta. John set to work trying to extract the base map from the flood overlay, so that we might have something to play with for making a print. Some of what he was able to do was elegant (switching off various bits of data in google maps in order to capture the mapping info) and some involved more brute force (doing a screenshot of the flood map layer and then photoshopping out irrelevant info). The map certainly has a dramatic effect. One metre of sea level rise seems to obliterate much of the city. I was thinking that it might be interesting to have these maps printed to use as a point of discussion with Guangzhou folks. This looks good – but we are acutely aware that this data is not really “zoomable” to this extent. At this level of enlargement, photoshop begins to invent information. Is this a problem? I talked to Clive Schofield, a friend from University of Wollongong who is a “bit of an expert” on geography and politics. What I really wanted to know was, how long will it take for the 1metre sea level rise scenario to play out? When could Guangzhou expect to see this happen? I am afraid that what you are asking for doesn’t really exist per se…It is a fiendishly difficult and complex business to try to disentangle causes of sea level rise and particularly to distinguish what proportion of sea level rise is attributable to a particular factor. Not only do bathtub modelling approaches generally not take into account regional variations in sea level but they also don’t accommodate how particular coast and coastal ecosystems interact with sea level. Such approaches generally treat coasts as static landforms, therefore imagining that as sea level rises it simply ‘marches up the contours’. While that might arguably be true for rocky coastlines it is a flawed approach for other coastlines including the low-lying generally soft sediment ones you are considering. It is important to realise that not only is sea level rise likely to be highly uneven spatially, but that its impacts on diverse coastal environments will be similarly varied. 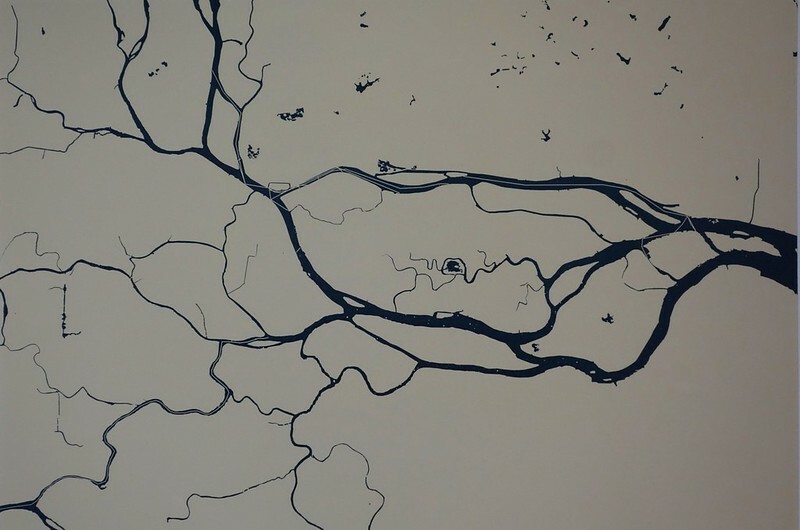 Clive suggested that one of the factors affecting the Pearl River Delta might be that if there is damming of the water further upstream, then the delivery of sediments to the delta which traditionally built up the land won’t be happening. In this case, independent of any sea-level rise, the delta lands may be in fact subsiding. This paper seems to support that idea. It’s all a bit overwhelming. Even though I’ve learned a fair bit in the last few weeks about all this stuff, not-knowing seems to be the main thing here. It makes me feel … how? Dissatisfied? A bit sick in the stomach, to be honest. The lesson from certain coastal ecosystems is that they are able to autonomously adapt to changing sea levels… if we allow them to. That is where management of coastal land and sea scapes becomes crucial. This entry was posted in residencies and tagged guangzhou on May 24, 2016 by Lucas. This entry was posted in odds and ends, residencies, writing by me and tagged guangzhou, haiku, poetry on May 1, 2016 by Lucas.